You are the first time on the German Christmas market – everything smells and looks amazing. You would like to try something traditional, but you have no idea what is traditional or tasty. We will help you to make your decision! 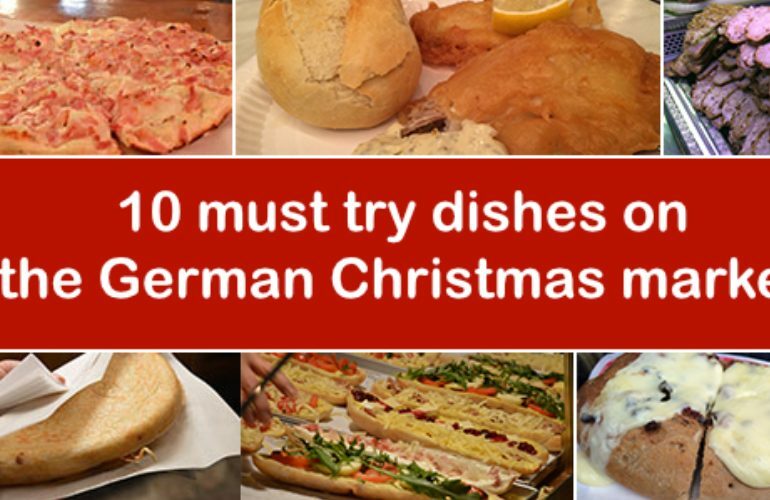 In this post you will find all dishes which are worth trying on the German Christmas market – not all of them are traditional but I can assure you – all of them are delicious! The first meal what you need to try being on Christmas market in Germany is German sausage. The sausages are grilled and served in bread roll with musterd or ketchup. There are different kind of sausages: Bratwurst, Rindwurst, Käsewurst, Paprikawurst, Chiliwurst, Krakauer, etc. Bratwurst is mostly composed of veal or pork, Rindwurst is made of beef and the Käse- (cheese), Chili-, Paprika- (paprika powder) can be composed of pork or beef. The sausage goes really well with any kind of mulled wine and it´s highly recommened not only during Christmas time. You can buy Bratwurst in every supermarket anytime in the year. Bratwurst is sold raw or cooked. Potato pancankes on the German Christmas market are served with apple or garlic sauce. The dish compose of grated raw potato, chopped onion, flour, egg and salt. The dough is formed in oval and deep fried. The potato pancakes are crunchy from outside and soft from inside. The pancekes we ate on the Christmas market were 1,5cm-2cm thick. That is another dish which goes so well with mulled wine. If you want to learn more about German potato pancakes please see the article: German potato pancake with garlic sauce. Raclette is a swiss dish served on the German Christmas market. It consist of cheese and bread with potato, bacon or tomato and champignons. The word “raclette” also refers to a cheese (semi-firm, cow’s milk) which is heated up and scrape on top of bread. Raclette was already mentioned in 11th century when it was used as a meal by cow herders which were moving cows to or from the pastures up in the mountains. At the end of the day they would place the cheese next to the campfire and let it melt until it was perfectly soft. Nowadays raclette is served often on the electronic raclette grills, which are available to buy in every supermarket. On the pictures above you can see how does the reclette look like. Tarte flambee come from French region Alsace which is located on the eastern border. Traditinally has a shape of rectangle. The traditional is made of bread dough, crème fraîche, onions and bacon. Flammkuchen was a homemade dish baked in the wood-fire oven inbetween the embers. It would take 1-2 minutes to before the dish was ready to eat. Sometimes the border of the tart would be burned from the flames. Nowadays Flammkuchen is served in restaurants with traditional German and French cousine so the tourists can eat it all year long. You can also buy it in every supermaket in this areas. The dish goas really well with white wine – and obviously – on the Christmas market with the warm mulled white wine. Everybody knows what pancakes is, right? Pancakes are made out of flour, eggs and milk. The German pancakes are different to Crêpes – the dough is thicker and so the pancake itself. Inside the dough you can find different ingredients – on the photo you can see pancake with bacon – it was one of the best pancakes I have ever had in my life. Pancakes are served very often with marmalade, apple sauce or sugar and cinnamon, but I love the savory version! Lard is a pig fat – on the German Christmas market is served on bread. Normally we would use it for cooking – but for some reason German like it on the bread during winter. It is actually finish speciality – Salomon is placed and fastend to the wooden trey. Next the pice of fish will be baked over the flames for 50-70 minutes. The Germans would use beechwood with alderwood for the fire – this gives the fish amazing flavour. Potato with cream cheese is actually a dish which the Germans cook when they dont have much in the fridge. Potato and cream cheese are the perfect combination: healthy, delicious and super easy. Very classic dish which Germans eat religiously. Potato with cream cheese are also easy to make at home, if you want to know how, here you will find the recipe: Potato with cream cheese. Backfisch refers to young fishes which were not good for frying or cooking – just for baking. In 16 century when somebody spoke about “backfish” could also refer to a gril. On the German Christmas market Backfish is served in bread roll with Remoulade. And who would actually think that fondue is served on the German Christmas market? It is! The dish has origins in Switzerland (from 1930 is was named the traditional dish of Switzerland). It is a melted cheese served in a large pot and eaten by dipping with long-stemmed fork pices of precel into the cheese. The word “fondue” comes from french word “foundre” and it means “to melt”. If you would like to know what you need to drink on the German Christmas market please read this post: 3 must try drinks on the German Christmas market.